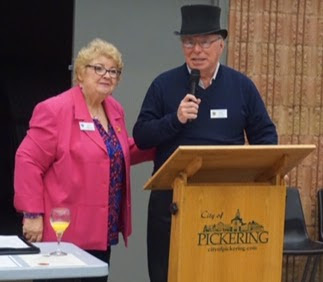 Sunbirds Women’s Probus Club in Wasaga Beach. 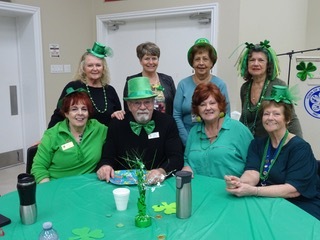 Bob MacNair, Director-Ontario District 7, and members of the Sunbirds Women’s Probus Club in Wasaga Beach. celebrating their Club’s 18th Anniversary and St. Patrick’s Day !!! Wasaga Beach PROBUS Club members raising PROBUS Banner at the Wasaga Beach Town Hall celebrating PROBUS Month. There are 5 PROBUS Clubs in Wasaga Beach with over 700 members. 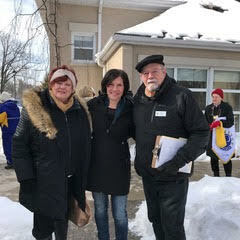 President, Vicky Nunnaro, of the Sunbirds Women’s Club of Wasaga Beach. 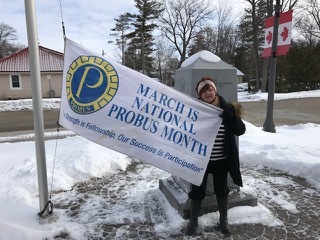 March is PROBUS month. 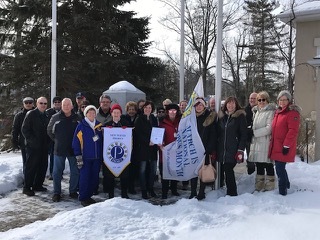 The Township of Scugog has recognized our Port Perry Club with a proclamation. We ordered a special cake to celebrate our good fortune in enjoying a local PROBUS club and all the benefits that entails. Gavel in memory of Andrew S. MacLeod, Charter President, presented at our General Meeting from the membership chair to Andrew's wife, Marian and then to the President for use at all future meetings to be passed along from President to President. Quilters and sewers of our club made a holder for the gavel in Muskoka plaid.